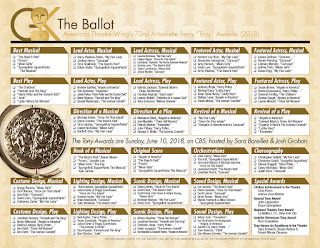 The Gold Knight team has compiled its annual Tony Awards printable ballot. The hit musicals "Mean Girls" and "SpongeBob SquarePants: The Musical" lead the pack for 2018 with 12 nominations each. 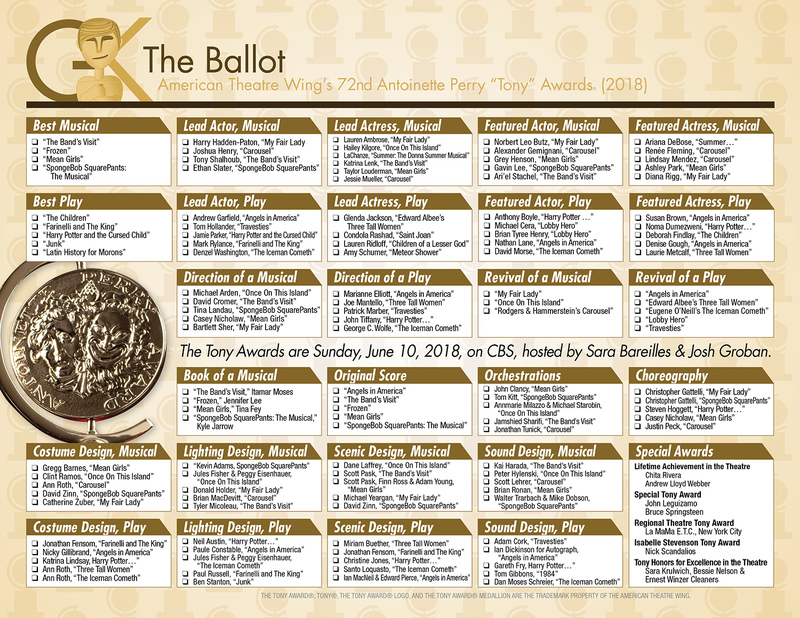 The Gold Knight team has compiled the nominees for the American Theatre Wing's 72nd Tony Awards. Find all of them here in our handy one-page, printable ballot. Feel free to download the ballot, print it out and pass out during your party (go here to download the PDF). Leading the pack this year are hit musicals "Mean Girls" and "SpongeBob SquarePants: The Musical," with 12 nominations each. While not the record-breaking "Hamilton," which garnered 16 nominations two years ago, both are nominated for Best Musical and other top categories. The other shows with double-digit nominations are "Angels in America," "The Band's Visit" and "Rodgers & Hammerstein’s Carousel" with 11 each. "Harry Potter and the Cursed Child, Parts One and Two" as well as "My Fair Lady" have 10 nominations each. “Legitimate theatrical productions” opening in any of the 41 eligible Broadway theatres during the current season are considered for Tony nominations. Eligibility for the 2017-2018 season began April 28, 2017 and ended April 26, 2018. 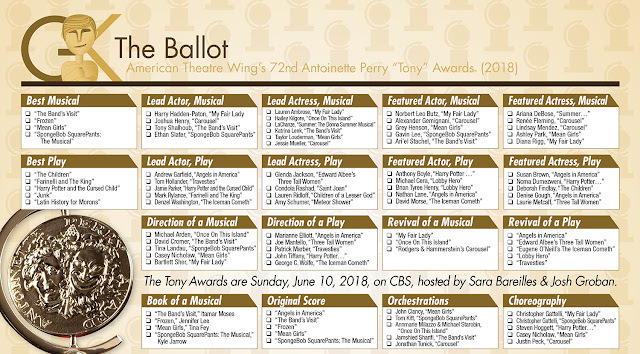 The winners will be chosen by 842 designated Tony voters within the theatre community. 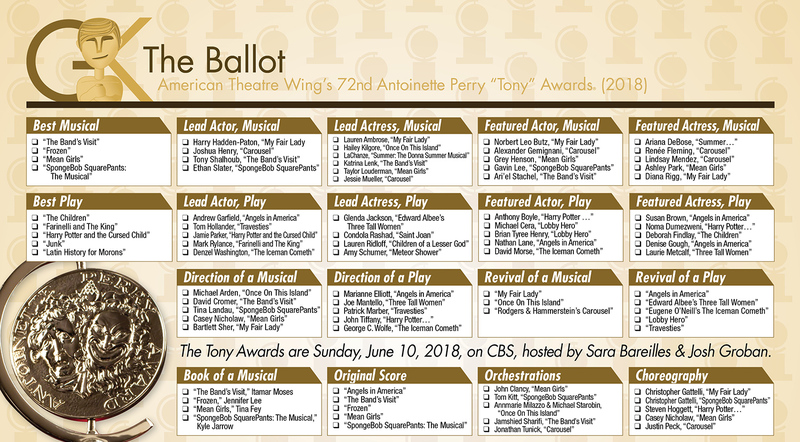 Tune in to the Tony Awards on Sunday, June 10, 2018, at 8 p.m. ET on CBS (tape delayed unfortunately on the West Coast). Tony Award Nominees Sara Bareilles and Josh Groban are set to host. The ceremony is again at New York City's Radio City Music Hall, after moving to the smaller Beacon Theatre on the Upper West Side of Manhattan in 2016. 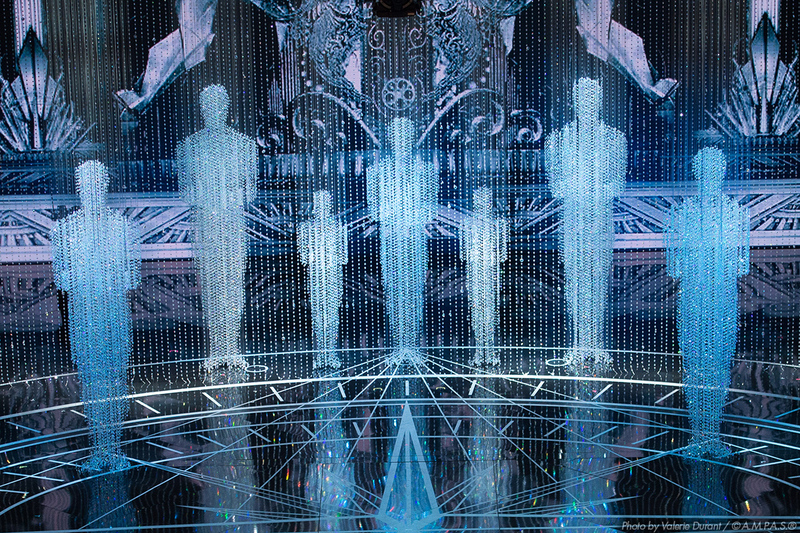 (The Beacon also hosted the show in 2011 and 2012). The Beacon Theatre seats about half as many people as Radio City (2,800 to 6,000) so many in New York should appreciate more tickets being available for Broadway's big night, even if the large stage doesn't give as close of a typical Broadway experience like the Beacon.